The new way to print t-shirts and textiles using sunlight. Permanent water-based dye for cotton and natural fibers. 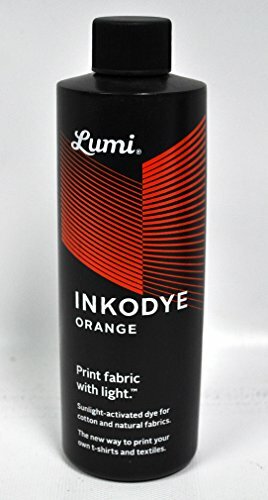 Inkodye is the world's only light-sensitive textile dye. Inkodye can be brushed, dipped, rolled, stamped, stenciled, screen printed and more! Works on most natural fibers such as cotton, rayon, linen, wool, silk and even leather, wood and unglazed ceramics. Won't fade or rub off and fabrics remain soft to the touch. To use: Shake well. Apply with roller or brush. Blot out excess with paper towel. Create your design using Inkofilm or anything that casts a shadow. Expose for 10-20 minutes or until color reaches full saturation. Machine as using Inkowash to remove unexposed dye. If you have any questions about this product by Lumi Co., contact us by completing and submitting the form below. If you are looking for a specif part number, please include it with your message.